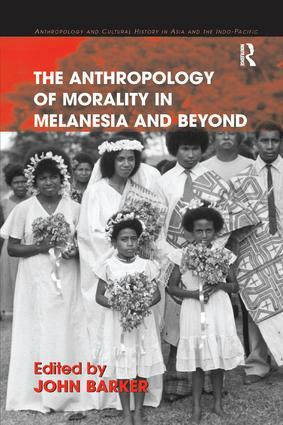 The Anthropology of Morality in Melanesia and Beyond examines how Melanesians experience and deal with moral dilemmas and challenges. Taking Kenelm Burridge’s seminal work as their starting point, the contributors focus upon public situations and types of people that exemplify key ethical contradictions for members of moral communities. While returning to some classical concerns, such as the roles of big men and sorcerers, the book opens new territory with richly textured ethnographic studies and theoretical reviews that explore the interface between the values associated with indigenous village life and the ethical orientations associated with Christianity, the state, the marketplace, and other facets of ’modernity'. A major contribution to the emerging field of the anthropology of morality, the volume includes some of the most prominent scholars working in the discipline today, including Bruce Knauft, Joel Robbins, F.G. Bailey,Â Deborah Gewertz and Frederick Errington. Contents: Introduction: the anthropological study of morality in Melanesia, John Barker; Part I Moral Exemplars in Village Society: Morality, politics and the Melanesian big man: on The Melanesian Manager and the transformation of political anthropology, Joel Robbins; When is it moral to be a sorcerer?, Doug Dalton. Part II The Morality of Modernity: Moral exchange and exchanging morals: alternative paths of cultural change in Papua New Guinea, Bruce M. Knauft; All sides now: the postcolonial triangle in Uiaku, John Barker; Reconfiguring amity at Ramu Sugar Ltd, Frederick Errington and Deborah Gewertz. Part III New Men and New Women: Changing minds : hysteria and the history of spirit mediumship in Telefolmin, Dan Jorgensen; Morals and missionary positionality: Diyos of Duranmin, Roger Ivar Lohmann; 'In the way' in Melanesia: modernity and the new woman in Papua New Guinea as Catholic missionary sister, Nancy C. Lutkehaus. Part IV Beyond Melanesia: Homo anthropologicus in aboriginal Australia: 'secular missionaries', Christians and morality in the field, Robert Tonkinson; Reaching for the absolute, F.G. Bailey; Epilogue, Kenelm Burridge; Bibliography; Index. John Barker is a Professor of Anthropology at the University of British Columbia, Canada. He has published extensively on the history of Christian missionaries and contemporary indigenous Christianity in Oceania and British Columbia, including the edited book, Christianity in Oceania (1990). His most recent book is Ancestral Lines: The Maisin of Papua New Guinea and the Fate of the Rainforest (2007).